Have you ever heard of a luxury hatchback? Neither had we, until the all-new Kia Forte5 was delivered to our showroom this month. It is a striking and extremely versatile 5-door compact car with the elegance of a mini limousine. The new Forte5 makes every day an exciting new adventure! 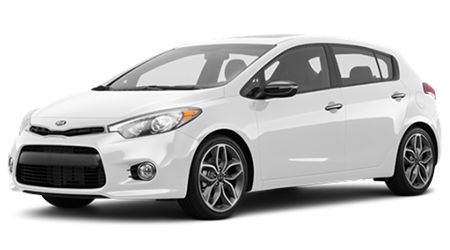 Come see the beautiful 2016 Forte5 in all its splendor at Cumberland Kia, one of the most trusted Kia dealerships in TN, where we have a large selection of the 2016 Kia Forte5 in all the latest trim levels and colors. Come in for a test drive at 1560 Interstate Dr in Cookeville, TN, and we promise an exhilarating experience you will not soon forget. Our facility is just around the corner from Lebanon, Crossville, Mcminville, Franklin, and Chattanooga, so everyone is invited for a first-hand look at the new Forte5. There are so many models, trim levels and accessory packages to choose from in the Kia Forte5 that you can customize it to match your personality perfectly. The base model Kia Forte5 LX comes with an impressive array of standard features. The high-quality cloth upholstery looks stately, feels comfortable, and improves the cabin acoustics. You chose the Forte5 model for its hatchback utility, and Kia extends the keyless entry feature to the fifth door - you can unlock the rear gate without fishing your key fob out of your pocket or purse. Also standard are Bluetooth® connectivity and a killer audio system with six strategically-placed premium speakers throughout the cabin. You get double-duty versatility from the rear door when combined with the Forte's ingenious 60/40 split-folding rear seats, allowing you to stow everything from bicycles to bookcases. As you enjoy the sporty handling of the spunky Forte5, and bask in its luxurious comfort, you need not think about the safety features, but they are there in spades when you need them. The Kia Forte5 is built on a unique impact-absorbing frame that protects all the occupants with crumple zones that direct the crash energy away from the driver and passengers. It's peace of mind, every mile of the way. The advanced airbag system comes complete with side seat-mounted airbags, curtain overhead airbags and "smart" airbag sensors, and the Forte5 has active headrests that yield during impact. Together they keep you and your entire entourage protected in a bubble of safety. First and foremost, the Kia Forte5 gives you hatchback practicality in a good-looking car that is fun to drive. So don't call it a hatchback, call it a 5-door stunner. There is nothing "compact" about the Forte5 when you step inside. With a cavernous passenger volume of 98.2 cubic feet, even your big & tall passengers will be able to stretch out comfortably, and there is a whopping 56.4 cubic feet of cargo space behind the first row. You will also thrill to the rush of the turbo-four model, if you opt for the 1.6L engine, and you won't sacrifice fuel economy. As well, critics have been raving about the Forte5's UVO infotainment system because it's one of the easiest on the market to program. For a sneak peek at the future of the hatchback, come to Cumberland Kia at 1560 Interstate Dr in Cookeville, TN, for a sweet deal on the sporty Forte5. At the very least, we think you'll be impressed with a quick jaunt in the SX Turbo, and with the ritzy interiors of all the 2016 Kia Forte5 models. We serve our friends and neighbors in Lebanon, Crossville, Mcminville, Franklin, and Chattanooga, so don't hesitate to visit us soon!